Description: Join Bemis Center’s Chief Curator and Director of Programs Rachel Adams for a lively and informative tour of Lui Shtini: Tempos. Shtini’s process translates abstracted thoughts into two-dimensional forms, birthing the intangible. His works in Tempos—both drawings and paintings—are shrouded in a layer of mystery, eliciting hints of the underlying subject matter. This is a unique opportunity to discuss the context and overarching theme of the exhibition and gain insight into the curatorial process. Access details can be found at bemiscenter.org/access. 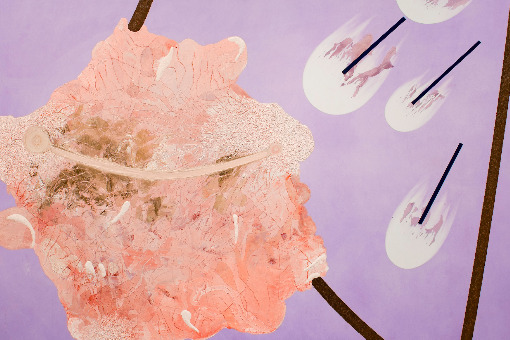 Lui Shtini; Odyssey (detail), 2018; Oil and enamel on Dibond; Courtesy of the artist and Kate Werble Gallery, New York, NY; Photo: Colin Conces.